Finding the best UPS, or uninterruptible power supply, for your business is one of the most important decisions you can make if you rely on PCs, servers and other electronics being on 24 hours a day, seven days a week. This is because the best UPS will keep supplying power to devices that are plugged into it, even if there’s a power cut. This is because while the power is on, the UPS will keep a battery charged. If, for any reason, the power si cut, the UPS will seamlessly switch to battery power, and continue to power the devices until either the main power is restored, or you’re able to safely shut down your device. A sudden loss of power can cause problems for a ton of different devices, like data corruption, and if a server loses power, it means you lose access to its resources. This can prove disastrous for many companies. That’s why you need to consider certain things when you’re looking for the best UPS. For one, you’ll want something that can provide enough power for you to get to your devices. To make things easier, we’ve picked the best UPS for your consideration. The UPS devices we include in this guide cover a wide range of use cases, from small UPS devices for homes that can keep a router and PC running, to large and powerful UPS devices for enterprise uses. Because of this, we have listed these best UPS devices in no particular order. 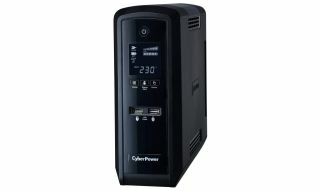 The CyberPower CP1500EPFCLCD is an excellent UPS for home and small business use. It comes with a decent amount of ports, as well as USB, for plugging in your devices. RJ11/RJ45 ports keep your phone, fax and modem lines protected from power surges, and it comes with a number of energy-saving features to prevent it from wasting energy when in use. It also comes with a clear LCD display that gives you information about the UPS. If you're after a cheaper, and more simple, UPS device, then the APC Back-UPS ES - BE700G is a great choice. We wouldn't recommend it for large businesses with lots of mission-critical computers and servers, but it offers plenty of power for homes and small businesses to keep their devices going when the power fails. If you're looking for something more feature-rich, however, you may want to consider a different UPS. This is another great UPS from APC, and with the BE600M1, the company has created a UPS device that is ideal for home use. That's thanks to its small and unobtrusive design, and if offers enough power for smaller devices, such as home NAS drives, routers and games consoles. With careful management, you can keep the power flowing to a router or monitor for enough time to overcome most power cuts. For office use, with lots of power-sapping devices that need to be powered at once, then you'll want to look elsewhere on this best UPS list, but for home users on a budget, this is a great choice. If you have a large office with several devices, then the Eaton Eaton 9SX 5000i RT3U is an excellent device. Not only does this rack-mounted UPS keep your important devices running when there's an issue with your power, but it also provides some excellent power efficiency features that can cut energy usage (and associated bills) with up to 95% efficiency in online double conversion mode and 98% in high-efficiency mode. You can buy optional extended battery modules for increased run time, and the LCD user interface makes it easy to manage. Definitely a UPS to consider if you have the budget. If you have a busy office with a number of essential devices that will need an uninterrupted power supply, then the Vertiv Liebert PSI 1500VA is definitely worth considering. Its three batteries will keep power-hungry devices running when the power goes down, and it can be installed into a server rack, making it convenient as well. It comes in a number of configurations, so you can choose the one that best suits your needs, but if you're looking for a UPS for home use, then the APC BE600M1 Back-UPS 600VA above is a better choice.